Since 1992, I've personally photographed over 1,000 weddings, in every location, culture and religious denomination you can imagine. Instead of being the high point, sadly most ceremonies were forgotten soon after they ended. Unlike other officiants, being intimate with so many different ways to unite two people gives me insight as to what works and what doesn't. I knew I could use this experience and improve upon the ordinary and make it incredible. My career as a writer complements being a vocal soloist and speaker at my church. Not only can I write the words, I have the presence to deliver them effectively. But, in either scenario, my talents are only a mirror to reflect the hearts of my audience and echo the poetry they whisper as individuals and together. I am familar with and respected at every major reception venue in the area. I am also a certified lay speaker for the Methodist Church, an ordained and licensed minister by the Universal Life Church, a certified hospice volunteer, and am deeply involved with animal rescue. Although very active in my church, I do not require you to be. All that is asked is that you love and give credit to God for that gift. Paula was absolutely fantastic! From the moment my fiancée and I met her, Paula's funny and easy going personality, combined with her strong spirituality convinced us with no doubt that she was the one to marry us! 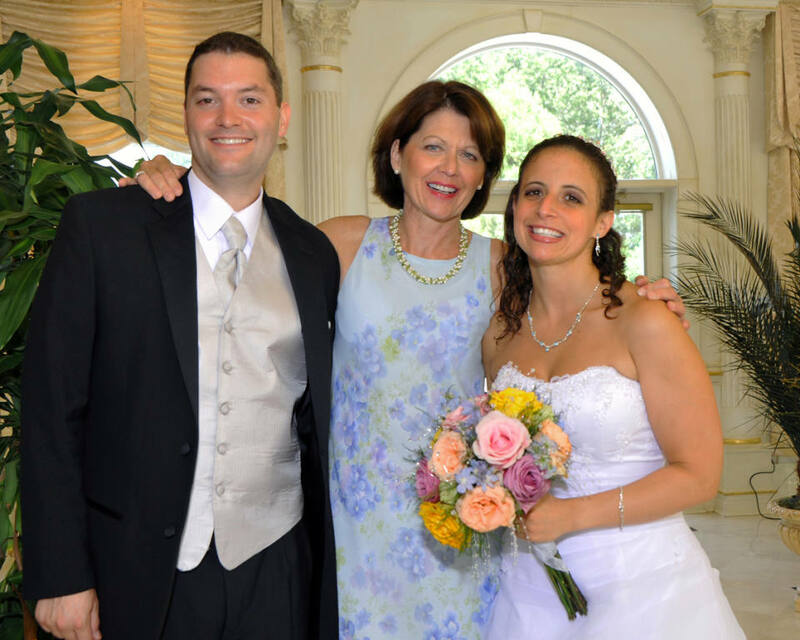 Coming from very different backgrounds, but each having a close and personal relationship with G-d, we wanted an officiant who would bring our spiritual differences together in a ceremony that would make ourselves and our families happy. Paula did just that. Additionally, she was so funny, that our friends had a blast too! She really went out of her way to get to know us. Then, she took that knowledge to really personalize our ceremony. We got so many compliments from all our guests about how very wonderful and "us" our ceremony was. We are so thankful to Paula for making our wedding day so unforgettable! Paula did an outstanding job performing our ceremony. When my husband and I met her for the first time, we knew right away that she was the right person to perform our ceremony. It was personalized just for us. Her writing was absolutely perfect. She told our story from the moment we met right to the day we got married. Everyone at the ceremony raved about how wonderful Paula was. Paula also was our photographer, she did an OUTSTANDING job with our pictures. We couldn't have asked for a more perfect ceremony and photographer! Thank you Paula. We would highly recommend you to anyone! Where to begin? I truly believe you were meant to marry Patrick and me. The ceremony was not only beautiful and sincere but was written with thoughtfulness, honesty and love. We thank you for creating and guiding us on this journey as we become man and wife. We are forever grateful to you! Please know that you've given us a ceremony beyond our wildest dreams and thank you! We were planning our wedding and was looking for a photographer and minister. Our caterers recommended Paula very highly. We called her up and made an appointment to meet her. She came to our home and from the first moment she entered the door we knew we found our minister and photographer. She was so warm and genuine, we felt like we knew her all of our life. She made planning our wedding so much easier. We had to answer questions about one another and not only was it fun to do it but the way she presented it at our wedding it made it even more special. She captured our lives on how we meet and all the things that make our relationship so special. It was great and she gave us the words she wrote on our special day and it’s something we will cherish the rest of our lives. And her photography is amazing. She captured us and how we felt about that day. The poses were fantastic. Not only did she take great pictures she mingled in with our guests and they loved her. She also went beyond her profession, she became a friend. My husband is a great Bruins Hockey Fan and we expressed that at our wedding. She found that so great that she contacted the Bruins Association and told the story of our wedding. As a result of Paula’s actions, we received a special gift from the Boston Bruins. It was such a surprise and it made our day. Four months later our family and friends still praise and talk about Paula. How great the ceremony was and how great the pictures were. She is truly a professional and has become for us a great friend. Paula was terrific as both our wedding officiant and photographer. The first thing we noticed about her was her great sense of humor. She made every situation lighthearted and fun! But when it came down to business, her true professionalism shined through. She has a great eye for seeing what will look best for photographs and the quality of her work is outstanding. We are extremely pleased with the photos from our wedding, and at how quickly she got them to us! Her assistant photographer Eric also did a fantastic job during the ceremony. As for officiating, Paula really got to know my husband and me from the beginning so that she could craft a beautiful message for us at our wedding. The speech was a surprise to us and what a special gift it was. It truly tied in the important aspects of our relationship. We do recommend Paula as an officiant and photographer to all engaged couples.